A confession of sorts from somebody who watches with hope from the sidelines as tragedies unfold. If ever you want to feel a sense of helplessness, steal a glance beyond our borders. I began doing so on a more regular basis – admittedly rather late in life, hearing in my youth only international tragedies that filtered their way through North American media – and ‘helplessness’ is one of few words I can think of to describe the cruel plights of others, as well as my reaction to them. Nearly a year-and-a-half ago, in April 2015, I read on a British news website of a fishing vessel packed with up to 850 men, women and children escaping war-torn countries in the Middle East, hoping to create new homes in the west. It capsized about 60 miles into its journey, leaving just 28 to be rescued from the Mediterranean. It was by no means the first such tragedy in the region – the previous week, in those same waters, another 400 funnelling through Libya drowned. Yet what a difference a few days made. A sympathetic response in the U.K. suddenly intensified, with some suppressing their ignorant anti-migrant rants (if only for a moment the year before their rather inward-looking Brexit vote). The response in Canada at that time was far more muted. No outcries. No tirades. No concern… a different form of ignorance. And, as I sat at my work desk, contemplating the huge loss of life because of war, money and politics, a feeling of hopelessness surged through me. I struggled to go about my day-to-day life in my tiny corner of the world – making plans with my children, focusing on hyper-local news items for Peace Arch News readers, selfishly trying to not give this inhumane tragedy more thought. I can’t say I was completely successful. Months later, another news item captured my – and presumably your – attention. One year ago last Friday, an image of Canada-bound Alan Kurdi, age 3, after he died in the Mediterranean Sea, made headlines around the world. Canadians reacted, and our politicians responded in kind. It became a federal campaign issue, and ultimately we pried our country open a little more to refugees. Yet again I did nothing. Unlike so many of you – through your churches and service groups and individually – I did not reach out to survivors of civil war, I did not fundraise and I certainly did not open my own home to those in need. Instead, I focused on my own loved ones and preoccupied myself with personal issues, protected by the luck of having been born within our own political borders, as insular in my actions as that pro-Brexit majority. And I realized that since first learning as a youth of death and destruction on the other side of the planet – and maturing well into adulthood – I’ve done exactly nothing to make their world a better place. Last month, another image of a Syrian boy captured attention around the globe, albeit this time with far less impact. 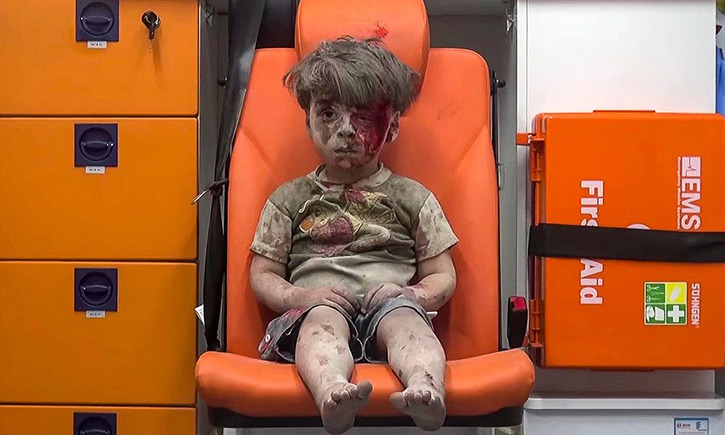 This was of a disoriented, bloodied – but very much alive – child identified as five-year-old Omran Daqneesh seated in the back of an ambulance and covered head to toe in dust after being dragged from his home following an airstrike in Aleppo on Aug. 17. If you haven’t looked at it, really looked at it, you should. It will likely resonate. And, regrettably, if you’re like me, you will do nothing more. I write this knowing full well that I look heartless. But I share a hopefulness that maybe, just maybe, my admission – my confession, really – will inspire others to be better than me. And, perhaps, my failings and inaction will lead in some small way to a world of increased helpfulness. Lance Peverley is editor of Peace Arch News.